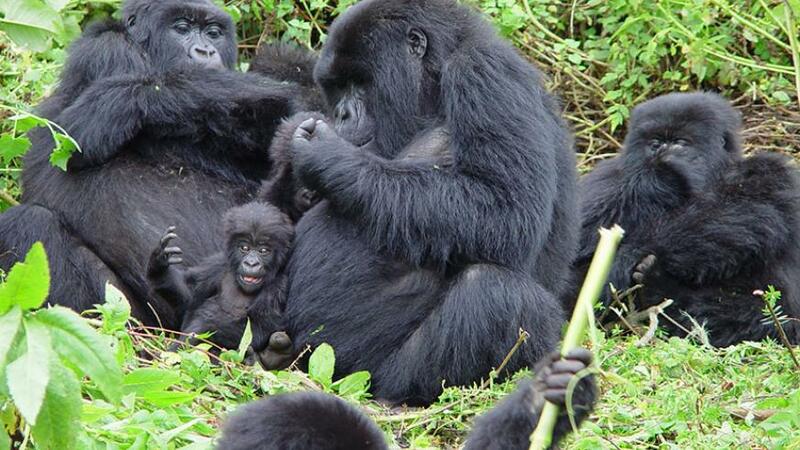 Join on elf the best 17 days gorilla tour that offers you an opportunity to trek gorilla in DR.Congo, Bwindi and also takes you to visit and see wildlife in parks like Murchison falls, Kabwoya game reserve, Kibale, Kidepo national park and so much more. Arrive at the airport to meet our company representative who will transfer you to your hotel in Kigali. Relax by the lodge as you prepare for tomorrow. Moderate – Gorillas golf hotel. Luxury – Serena hotel Kigali. Day 2: Transfer to Virunga National park. In the morning right after breakfast, you will drive to transfer to Goma. Overnight in Goma. Day 3: Gorilla Tracking / transfer to Volcanoes National park. Moderate – Five volcanoes hotel. Day 4: Golden monkey trek. Have an early morning breakfast and get ready to trek the golden monkeys. The Golden monkey scientifically known as Cercopithecus mitis kandti is a subspecies of blue monkey found only in the bamboo forests of the volcanic mountain chain which makes a part of the boundary between Rwanda, Uganda, and the Democratic Republic of Congo. Golden monkey trek is an experience that one compares to gorilla trekking in Rwanda, Uganda or Congo. Golden money trekking takes 2 t 4 hours and therefore, you should be back intimate for lunch. Overnight at your hotel. Day 6: Gorilla tracking in Bwindi Park. Early in the morning, take breakfast and move to the park headquarters for briefing. Move into the luxuriant ancient forest to search for the great apes. With your guide, hike into the forest where the gorillas were the night before and track from that point. The time to take searching for these great apes is unpredictable therefore your patience is very vital. This trek takes from 2 to 8 hours and climb to altitudes in excess of 7,500 feet. The terrain is rough and at times muddy. Day 7: Drive to Queen Elizabeth park. After that moment with the ancient apes, drive through the Ishasha region of Queen Elizabeth National Park. In this area there are tree climbing lions which you may be lucky to see. Get ready for dinner and overnight at. Day 8: Game drive / Boat ride. Wake up early morning for a game drive searching for the early risers. Come back to the Lodge for mid morning breakfast. You may have the chance of seeing warthogs, elephants, buffalos, bushbucks, waterbucks and several other interesting animals. After lunch, head for the afternoon launch cruise at the Kazinga channel. This channel joins Lake Edward to Lake George. You will spot the hippos, crocodile and water birds quenching there thirst while others are playing in the water. Come back to your lodge for dinner and overnight. Day 9: Transfer to Kibale National park. Day 10: Chimpanzee tracking / Bigodi nature walk. After breakfast, carry your tracking gears and move to the headquarters for briefing. You will be lead into the damp luxuriant, cool and thick forest. 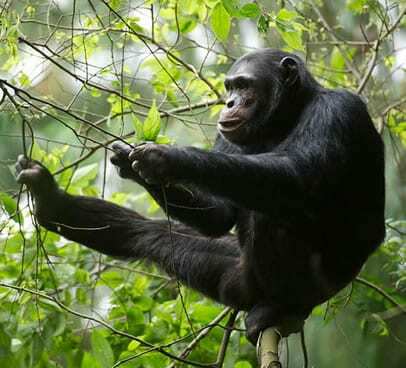 The guide will explain to you the types of tress that you come across, you will also see a number of other primates like monkeys that jump from tree to tree, Colobus Monkeys Giant forest hog, Vervet, red-tailed monkeys, the Grey Cheeked Mangabeys, and Olive Baboons. The birds are also in plenty. Continue searching for the stimulating human cousins because they are very mobile. You may hear them hoot before seeing them. Watch the beautiful chimps for some time and come back for lunch. In case you are not so tired, move on for a community walk in the Bigodi community. You will watch some ladies making hand crafts and if there is ample time, you will visit the community school. Return to your lodge for dinner and overnight. Day 11 ; Visit tea Plantation. / Drive to Lake Albert / Kabwoya game reserve. Go visit the tea plantation to learn more about the growing tea, tea harvesting and processing of tea in Uganda. Later in the afternoon, you will relax at your hotel. Later in the afternoon, you will drive to transfer to Kabwoya game reserve. Overnight at Lake Albert Safari Lodge. Day 12: Drive to Transfer to Murchison Falls park. Wake up early in the morning for a game drive in the Northern sector of the park. Most of the game is to be found in the area north of the Victoria Nile River and East of the Albert Nile and Lake Albert. This is where part of the movie “The African Queen” was filmed. Game is now returning quite rapidly and game drives can be very exciting. During the Game drive, you may have the chance of seeing elephants, oribi, giraffes, waterbucks, hartebeests, topi, buffalo, sitatungas, bushbucks, warthog, bush pig, lion, leopard, mongoose, genet, hyena, jackal and bat eared fox. Return for lunch and move down for an eye captivating launch cruise. Get to see birds like the ancient dying out shoe bill, yellow footed fly catcher, ituri batis, white thighed hornbill and other interesting birds. You will have time to see the elephants, buffalos, giraffes at a closer proximity. Take there photographs too. Return to your booked lodge for dinner and overnight. Day 14; Transfer to Kidepo Park. In the morning right after breakfast, you will drive to transfer to Kidepo national park. This is a long drive. Luxury – Apoka safari lodge. Rise up early in the morning and head to the park premises for a game drive. This park has variety of wild creatures to see that are untapped. You may have the chance of seeing bat eared foxes, striped hyenas, caracal, cheetas, leopards, lions, ostriches, zebras, bush pigs, defassa, eland. Bush bucks, elephants, lions the list is endless. There are no restrictions to length of game drives but are generally in the mornings and late afternoons because it can be quite hot. Have game walks as per clients’ wishes and requests. Return for dinner and overnight at your lodge. After breakfast, walk to the Karamojong community. These are people who have stuck to there traditions since the ancient days. Karamajongs are similar to the Masais in Kenya and are mainly cattle keepers who dress usually in brief clothes or at times no clothes. Living in homesteads called the Manyattas, they also love wearing beads around their necks and waist. They remove their front teeth as believing it’s a sign of beauty. Return to your lodge for dinner and overnight. 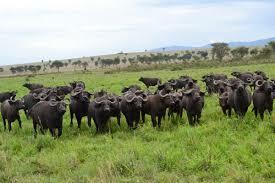 Having concluded your tour through Uganda and Rwanda, fly to Entebbe airport for your flight returning home. End of the 17 days Gorilla Tour.